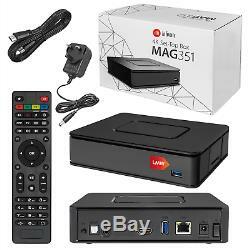 MAG 351 Set Top Box IPTV Linux 4K UHD Builtin Wifi Bluetooth MAG351 UK PLUG. We strive for unbeatable prices with our store, so you don't have to worry about savings. Our main priority at LMW is that our customers are satisfied. Brand New Genuine MAG 351 4K Set top Box. MAG351/352 is a premium IPTV/OTT Set-Top Box for operators, providing TV services via IP networks. The main advantage of the MAG351/352 is 4K standard support that will give your subscribers an opportunity to watch video in the best quality. In turn, the 2 GB of RAM and Broadcom chipset with 12 000 DMIPS create extra velocity. 4K support; HEVC support; Super-power media processor with Broadcom chipset and 12 000 DMIPS productivity; 2 Gigabyte of RAM; In-built dual-band Wi-Fi 2.4GHz/5GHz(ac)(optional) and Bluetooth 4.0 adaptors. Premium Class IPTV/OTT Set-Top Box. Support of 4K MAG351/352 can playback up-to-date video resolution UltraHD, giving the most realistic image. Content Security Integration with the Verimatrix Advanced security core for HD and Ultra HD content. Increased Productivity Larger RAM and powerful media processor by Broadcom allowed us to increase the velocity of STB. Functions on Demand MAG351/352 plays the latest audio and video formats and it supports subtitles, format and image settings, choice of audio track and work with the playlists. Powerful Video Processor Next-generation 2.7Gpix/s 3D OGLES3.1 GPU. Choose Other 24 Hour Courier. We will then send your item via DPD - a service with numerous advantages. No need to stay in all day! Follow My Parcel service lets you see where the driver is and get a final 15 minute time-slot. If you are unavailable, the courier should leave a calling card and take the parcel back to your local depot. Alternatively, you can collect the parcel from your local depot. LMW is a long established specialist computer company, supplying IT hardware for over 2 years. We have grown to become one of the UK's leading online retailers and built an enviable reputation for superb value, quality and service. Our extensive range of components and consumer electronics ensures that we are able to provide you with the right product at a competitive price, whether it is a Desktop PC, Laptop, PC accessory or an upgrade to your existing system. Here at LMW we have a successful history of providing a dedicated corporate & education service to companies and establishments. Our dedicated account management team will work with you to understand and satisfy your hardware requirements. Contact our dedicated business team for more information. Please send us a message. And we will arrange the return of the item. For faulty or incorrectly described items, we provide the above service free of charge. If you change your mind and want to return an item, we can provide the above service for a small charge. The item "MAG 351 Set Top Box IPTV Linux 4K UHD Builtin Wifi Bluetooth MAG351 UK PLUG" is in sale since Wednesday, February 20, 2019. This item is in the category "Sound & Vision\TV & Home Audio Accessories\Internet TV & Media Streamers". The seller is "lm-wholesale" and is located in Rainham. This item can be shipped to United Kingdom.